As with the previous Beatitudes, this last one will seem incomprehensible to one that is not filled by the Holy Spirit. The unsaved soul cannot associate the blessings, the honor, or the peace of mind that comes with humility, mourning over sin, meekness, righteousness, mercy, purity of heart, or being reviled or persecuted. The very thought of persecution to their mind is not one to rejoice over, it is not one to be glad for, it is one to be avoided at all costs. It is not one to be desired for any cause or belief. Jesus tells us here that those who are called children of God will understand that their persecutions for His sake will be rewarded greatly in heaven. Our hope as Christians is in promises such as these. In the previous Beatitudes Christ defined the Christian’s character. Jesus has told those who abide in him that they will be with Him in the Kingdom of Heaven, they shall be comforted, they will inherit the earth, they shall be satisfied, they will receive mercy, they will see God, and they will be called sons of God. He now tells them that because they are in the world and not of it, because they call on His name above all others they will be reviled and persecuted on His account. The rich young ruler of Mark 10:17-27 left disappointed when Jesus told him he must “sell all you possess and give to the poor, and you will have treasure in heaven; and come, follow Me.” That young man could not make that sacrifice. That young man passed on eternal life in exchange for his possessions. Jesus is now telling Christians that they will have to suffer persecution if they follow Him. He has defined His followers in the first seven Beatitudes and He has defined their blessings. He now tells those that take up their cross and follow Him they must expect to be persecuted for it. Those who turn away from the world, who live righteously will inevitably be persecuted for it. The traits of the Christian life that He previously preached generates hostility and antagonism from the world. There is a price for following Jesus. Jesus told His disciples of that price. “If anyone wishes to come after Me, he must deny himself, and take up his cross and follow Me. For whoever wishes to save his life will lose it; but whoever loses his life for My sake will find it. For what will it profit a man if he gains the whole world and forfeits his soul? Or what will a man give in exchange for his soul? For the Son of Man is going to come in the glory of His Father with His angels, and will then repay every man according to his deeds.” (Matthew 16:24-27). Paul wrote of the persecution that he endured. “Now you followed my teaching, conduct, purpose, faith, patience, love, perseverance, persecutions, and sufferings, such as happened to me at Antioch, at Iconium and at Lystra; what persecutions I endured, and out of them all the Lord rescued me! Indeed, all who desire to live godly in Christ Jesus will be persecuted.” (2 Timothy 3:10-12). The Puritan writer Thomas Watson said of Christians: “The godly are called living stones’ (1 Peter 2:5). And they must be hewn and polished by the persecutor’s hand that they may be fit for the heavenly building. The saints have no charter of exemption from trials. Though they be ever so meek, merciful, pure in heart, their piety will not shield them from sufferings. They must hang their harp on the willows and take the cross. The way to heaven is by way of thorns and blood. Though it be full of roses in regard of the comforts of the Holy Ghost, yet it is full of thorns in regard of persecutions.” Watson, Thomas, The Beatitudes: An Exposition of Matthew 5:1-12, p. 360, Kindle Edition. Peter writes in 1 Peter 4:16 “but if anyone suffers as a Christian, he is not to be ashamed, but is to glorify God in this name.” The early Church did just that. Persecution from the Jews is recorded throughout the Book of Acts commencing with the stoning of Stephen. Paul would suffer the abuse as we just read in 2 Timothy 3:10-12. There would be violent persecution from Rome intermittently up until the time of Constantine in 313 with a brief flare-up under Julian the Apostate. Throughout the centuries Christians would suffer martyrdom at the hands of the Persians and Jews during the Roman-Persian Wars in the early seventh century. Mass persecution would occur under Islam. People of faith would die at the hands of co-religionists in the Roman Catholic Church and by the Reformed Churches. Persecutions have continued up to and including the 20th and 21st centuries in Nazi Germany, the Soviet Union and the Warsaw Pact Countries, China, and India. In the Muslim world Christians are being persecuted in Bangladesh, Pakistan, Iraq, Iran, Egypt, Sudan, Indonesia, Somalia, Algeria, Afghanistan, Kosovo, Malaysia, Nigeria, Saudi Arabia, Senegal, Syria, Tunisia, Turkey, Yemen, and Bhutan. 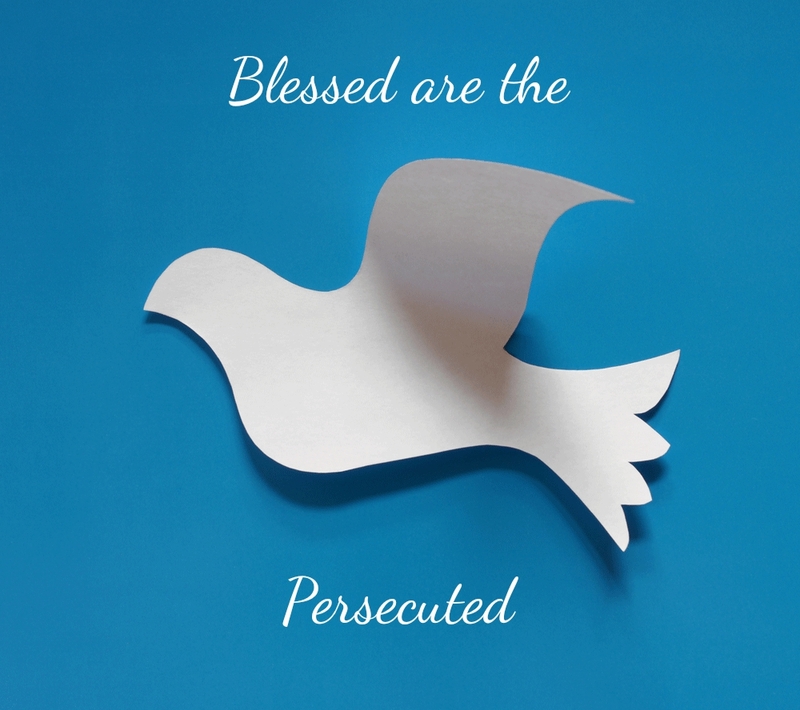 The blessings that the Beatitudes have promised are secure to those that believe even under persecution and unto death. The perfection of those promises are yet to come. In our Eternal State in Heaven we will fully realize these blessings as God’s people. For He has told us in Revelation 21 that He will wipe away every tear from our eyes, and death shall be no more, neither shall there be mourning, nor crying, nor pain anymore, for the former things will have passed away. He will make all things new. To the thirsty He will give from the spring of the water of life without payment. He has promised that those who conquer will have this heritage, and He will be our God and we will be His sons.